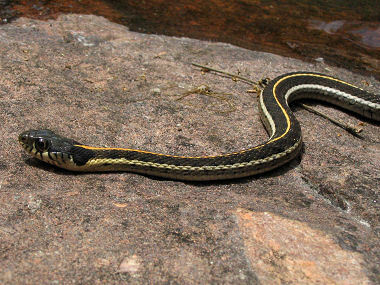 The Black-necked Garter Snake is a slender snake with a maximum length of 3.25 feet. They have light-colored stripes on the top and sides of an otherwise olive-green or dark body and 2 large black blotches just behind the head. The species is found throughout the Sonoran Desert with a rang extending from southeastern Utah to Guatamala and from central Texas to central and southern Arizona. Isolated populations occur in the Hualapai Mountains, Burro Creek, and Ajo mountains in western Arizona. The large black spots just behind the snake's head in the photo at right identify it as a Black-necked Garter Snake. The Black-necked Garter Snake is semi-aquatic and is generally found in or near bodies of water ranging from streams to canals, ponds, and cattle tanks (in fact the snake in this photo was found next to a stream with half its body lying in the water). The snake feeds on aquatic or semi-aquatic prey, including fish, frogs, toads, tadpoles, worms, salamanders, and crustaceans, though lizards, small mammals, and birds may also be eaten. Garter snakes bear live young, generally giving birth to 6 to 18 baby snakes in the summer. If disturbed, garter snakes will bite, defecate, and emit foul-smelling musk to deter the intruder.